New PEM SpotFast fasteners, from PennEngineering, Danboro, PA, paired with a specially designed wave washer, allow attachment of two thin sheetmetal parts in applications that also require pivoting or hinging action. 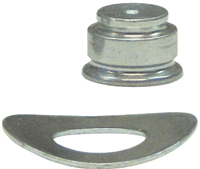 The self-clinching fasteners (Type SFW) permanently join the two panels to create a flush-attachment connection without protrusions on either side. The compatible wave washer delivers consistent torsion to promote repeatable hinging action while attachment remains secure. The steel fasteners have zinc plating with integral lubricant to promote smooth operation. They can join dissimilar metal alloys or sheets with different thicknesses, and install in steel or aluminum sheets as thin as 0.031 in. with hardness of RB 80 or less. To install the fastener, the fabricator first prepares a properly sized hole in both panels, then installs the fastener in one panel, places the wave washer over the installed fastener, and then situates the second panel over the fastener. Sufficient squeezing force permanently fastens the joint smooth with the top sheet and flush or sub-flush with the bottom sheet.